Davinci Lighting Solar Post Cap Lights provide functional, decorative, and classy landscape lighting that makes your outdoor spaces shine! - Fixtures can fit all standard 4 inch or 6 inch post caps. - Can also be mounted securely on any flat surface such as patio or deck tables. - Lights are wireless and completely self-contained. - You can relax and rest assured that your lights will be on when you need them. - A built-in photosensor automatically turns on the lights at night, so you'll never be in the dark. - We've worked hard to build the best lights, because our customers deserve great value. 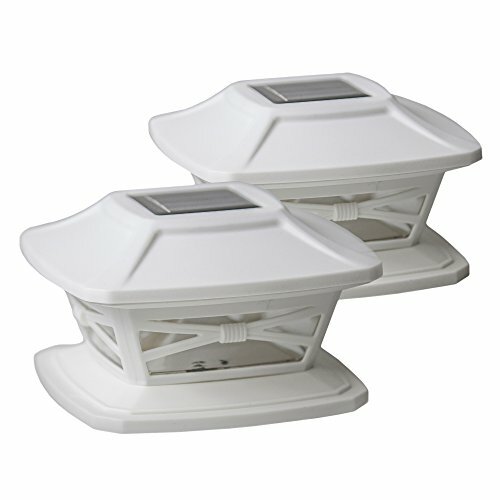 - The entire housing is UV resistant so its color won't fade over time. - Matte textured finished keeps lights always looking classy. - Weather proof construction for use in rain, sleet, or snow. - LEDs last 100,000 hours, so you won't need to replace any bulbs. - No need for messy wires to connect to your home's power. - No need for the cost and headache of professional installation. - 2 warm white (3000 Kelvin) wide angle LEDs, 15 lumens total. - 3.2v 300mAh lithium ion AA rechargeable battery (replaceable). - Advanced monocrystalline solar panel. - 6-8 hour battery life after 8 hours of direct sunlight. - The exact dimensions of a "standard 4x4" post are 3.5 x 3.5 inches, and the exact dimensions of a "standard 6x6" post are 5.5 x 5.5 inches. Don't worry, our post cap lights will fit any post between 3 to 5.75 inches. - 4 screw holes in base are arranged as a 2-3/16 in. (5.5cm) square. MAKE YOUR HOME SHINE - An easy and affordable to way to add an upscale aesthetic to your property. Make your home stand apart. Bright (15 lumen) warm white LED lights with an appealing modern design. QUALITY - Designed by real home owners for real life use. Industrial grade plastic with UV fade protection. Hardened tempered glass to protect solar panels. IP44 weatherproof. LEDs last 100,000 hours. SOLAR POWERED - One day of direct sunlight provides 8 hours of power. Automatically turns on at night. Advanced monocrystalline solar panels charge a 3.2v 300mAh lithium ion rechargeable battery. EASY DIY INSTALL - Super simple installation. Included stainless steel screws go vertically through the base of the fixture and into the top of the post. If any problems, our excellent customer service will take great care of you. If you have any questions about this product by Davinci Lighting, contact us by completing and submitting the form below. If you are looking for a specif part number, please include it with your message.